JUNG Ji-woo’s new thriller Silence, which stars CHOI Min-shik in the lead role, completed four months of production in Bangkok, Thailand, which included 61 shooting days, on February 7th. Silence is a remake of the Chinese film Silent Witness (2013) and co-stars PARK Shin-hye and RYU Jun-yeol. CHOI stars as a financial tycoon whose fiancee, a young, popular singer, is found murdered. Suspicion then falls on his daughter. The Chinese original, directed by FEI Xing and featuring SUN Honglei and Aaron KWOK, had its international premiere at the Busan International Film Festival. Star CHOI Min-shik, last seen in period hunting epic The Tiger (2015), has two upcoming projects, having previously wrapped the election drama The Mayor, which will be released by Showbox at some point in the second quarter of this year. Director JUNG, known for Eungyo (2012), last helmed the critically-acclaimed indie Fourth Place (2016). PARK’s film credits include Miracle in Cell No.7 (2013) and last year’s MY ANNOYING BROTHER while RYU is a rising star with several high profile credits coming this year, including the Lunar New Year hit The King and this summer’s A Taxi Driver. The film also features LEE Ha-neui (SORI: Voice from the Heart, 2016), PARK Hae-joon (Fourth Place, 2016) and CHO Han-cheul (Pandora, 2016). 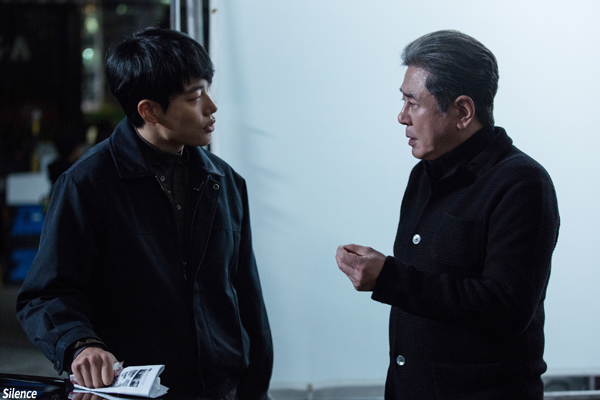 From production house Yong Film and distributor CJ Entertainment, Silence is expected to open later this year.